5th Annual Spring Festival Registration in Irvine,Ca. The Date for the 5th Annual Spring Festival is Saturday March 20, 2010. 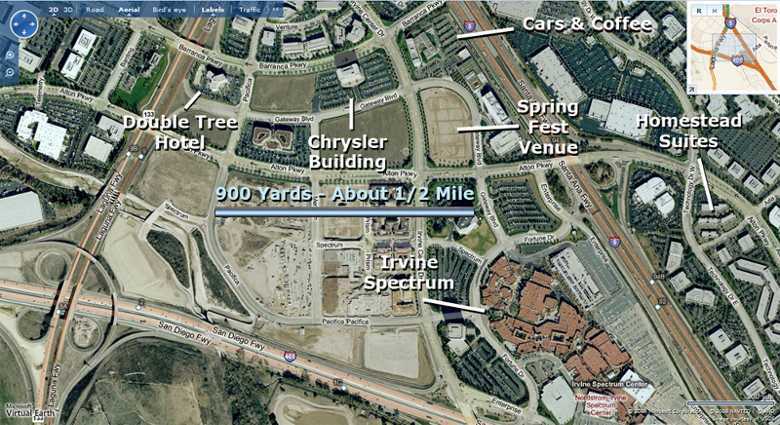 The event will be held in Irvine, Ca and will be the largest event to date with a goal of over 700 LX/LC vehicles. This is open to all no matter if your car is stock or completely modified. Here is where you will see it all, put a face to the screen name, see vendors and meet the leadership of Chrysler. This year the Double Tree Irvine will be the exclusive hotel for the event. The rooms have been reserved if you would like to make your reservations you may contact Marlo Klein, Director of Sales and Marketing, Doubletree Hotel Irvine Spectrum 90 Pacifica, Irvine, CA 92618, Direct 949-471-8605, Fax 949-471-8996. The room rate will be $89 with $7 overnight parking. The Double Tree will offer additional parking security the weekend of the event. REGISTRATION will be open January 1, 2010 on www.SoCalLX.com. Until then make your plans to attend! This is an event you don't want to miss. Plus there is no charge for this event just sign up. We are all members of the forums because of the passion we have for these cars. So we post photos of our cars, our mods and ask questions about our cars. Spring Festival is where you will see it all and meet those who help us find the answers to our questions. You can see it all first hand and talk directly to members that you have become friends with on line. You may be a senior member or a newbie, have a full blown modified car or a totally stock car, it makes no difference to us. If it will be your first event you will not believe how great the people are. If you don't bring your car we don't care, someone in the group will give you a ride. This is an experience of a life time and those who return year after year will tell you so. That's why they post and encourage everyone to attend. Hope to see you there. We have 78 Challenger signed up so far are you one of them? This is a show you don't want to miss. For those of you not signed up yet this is something you don't want to miss. There is no where you will ever see this many Challengers in one place. We have people coming from 20 states and Canada. I'm the only Challenger SE showing up, but I think that may be a typo as I have an SXT, that option wasn't given. The meeting place for the Spring Festival will be the Chrysler Building at 7700 Irvine Center Dr. 92618 it is on the corner of Irvine Center Dr and Gateway Blvd. You enter the parking lot on Gateway Blvd. We will be meeting there at 8:30 A.M. and pulling out just before 9:00 to line up on Gateway. Quick Reply: 5th Annual Spring Festival Registration in Irvine,Ca.